Genetically engineered rat models are gaining popularity as the preferred biological model for several research areas. ASC can genetically engineer rat models with a physiologically relevant modifications using an expanded technology portfolio with complementary CRISPR/Cas9 and TARGATT™ technologies, as well as, traditional homologous recombination and random transgenic technologies. Conditional knock-out/ expression mouse model generation to accurately model temporal and spatially controlled gene expression in rats. Fast and Reliable! Site-specific, safe harbor locus large transgene knock-in for gene overexpression and custom Cre rat line generation. 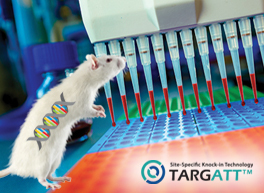 Full service CRISPR rat model generation with precise gene knockout, knock-in, and point mutation modifications for basic and preclinical research. Applications: Functional genomics, disease modeling, target identification and validation for drug discovery and screening, and many more. Applied StemCell uses two complementary genome editing technologies to generate advanced cell line and animal models very efficiently and effectively: the CRISPR/Cas9 technology and our propriety site-specific gene integration technology, TARGATT™ for large fragment (up to 22 kb) knock-in into a safe harbor locus. We also offer mouse model generation service using an expanded technology portfolio such as traditional homologous recombination via ESCs, bacterial artificial chromosome and random transgenic technologies. With our expertise in mouse model generation service and various genome editing technologies, we can assure you a custom genetically engineered mouse model perfect for your research needs. Bacterial Artificial Chromosome (BAC) Knock-in and Conditional Knock-In Rat Models. We also offer BAC knock-in and conditional knock-in rat model generation service for very large gene insertions (up to 300 kb), making them ideal for introduction of entire genes including the regulatory regions into the rat genome. Alternatively, you can choose to have us do the BAC modification strategy and cloning, and you can do the pronuclear injections and transgenic rat screening yourself. Smalley, E. (2016). CRISPR mouse model boom, rat model renaissance. Nature Biotechnology. 34, 893–894. Baker, M. (2014). Gene editing at CRISPR speed. Nature biotechnology, 32(4), 309-313. Ruan, J., Li, H., Xu, K., Wu, T., Wei, J., Zhou, R., ... & Chen-Tsai, R. Y. (2015). Highly efficient CRISPR/Cas9-mediated transgene knockin at the H11 locus in pigs. Scientific reports, 5, 14253. Deng, F., He, S., Cui, S., Shi, Y., Tan, Y., Li, Z., ... & Peng, L. (2018). A Molecular Targeted Immunotherapeutic Strategy for Ulcerative Colitis via Dual-Targeting Nanoparticles Delivering miR-146b to Intestinal Macrophages. Journal of Crohn's and Colitis. Jo, S., Fonseca, T. L., Bocco, B. M. D. C., Fernandes, G. W., McAninch, E. A., Bolin, A. P., ... & Németh, D. (2018). Type 2 deiodinase polymorphism causes ER stress and hypothyroidism in the brain. The Journal of Clinical Investigation. Langston, R. G., Rudenko, I. N., Kumaran, R., Hauser, D. N., Kaganovich, A., Ponce, L. B., ... & Beilina, A. (2018). Differences in Stability, Activity and Mutation Effects Between Human and Mouse Leucine-Rich Repeat Kinase 2. Neurochemical research, 1-14. Amara, N., Tholen, M., & Bogyo, M. (2018). Chemical tools for selective activity profiling of endogenously expressed MMP-14 in multicellular models. ACS Chemical Biology. doi: 10.1021/acschembio.8b00562. Allocca, S., Ciano, M., Ciardulli, M. C., D’Ambrosio, C., Scaloni, A., Sarnataro, D., ... & Bonatti, S. (2018). An αB-Crystallin Peptide Rescues Compartmentalization and Trafficking Response to Cu Overload of ATP7B-H1069Q, the Most Frequent Cause of Wilson Disease in the Caucasian Population. International journal of molecular sciences, 19(7). Peng, L., Zhang, H., Hao, Y., Xu, F., Yang, J., Zhang, R., ... & Chen, C. (2016). Reprogramming macrophage orientation by microRNA 146b targeting transcription factor IRF5. EBioMedicine, 14, 83-96. Hu, J. K., Crampton, J. C., Locci, M., & Crotty, S. (2016). CRISPR-mediated Slamf1Δ/Δ Slamf5Δ/Δ Slamf6Δ/Δ triple gene disruption reveals NKT cell defects but not T follicular helper cell defects. PloS one, 11(5), e0156074. Besschetnova, T. Y., Ichimura, T., Katebi, N., Croix, B. S., Bonventre, J. V., & Olsen, B. R. (2015). Regulatory mechanisms of anthrax toxin receptor 1-dependent vascular and connective tissue homeostasis. Matrix Biology, 42, 56-73. McKenzie, C. W., Craige, B., Kroeger, T. V., Finn, R., Wyatt, T. A., Sisson, J. H., ... & Lee, L. (2015). CFAP54 is required for proper ciliary motility and assembly of the central pair apparatus in mice. Molecular biology of the cell, 26(18), 3140-3149. Bishop, K. A., Harrington, A., Kouranova, E., Weinstein, E. J., Rosen, C. J., Cui, X., & Liaw, L. (2016). CRISPR/Cas9-mediated insertion of loxP sites in the mouse Dock7 gene provides an effective alternative to use of targeted embryonic stem cells. G3: Genes, Genomes, Genetics, 6(7), 2051-2061. Zhu, F., Gamboa, M., Farruggio, A. P., Hippenmeyer, S., Tasic, B., Schüle, B., ... & Calos, M. P. (2013). DICE, an efficient system for iterative genomic editing in human pluripotent stem cells. Nucleic acids research, 42(5), e34-e34. Tasic, B., Hippenmeyer, S., Wang, C., Gamboa, M., Zong, H., Chen-Tsai, Y., & Luo, L. (2011). Site-specific integrase-mediated transgenesis in mice via pronuclear injection. Proceedings of the National Academy of Sciences, 108(19), 7902-7907. Fan, X., Petitt, M., Gamboa, M., Huang, M., Dhal, S., Druzin, M. L., ... & Nayak, N. R. (2012). Transient, inducible, placenta-specific gene expression in mice. Endocrinology, 153(11), 5637-5644. Hippenmeyer, S., Youn, Y. H., Moon, H. M., Miyamichi, K., Zong, H., Wynshaw-Boris, A., & Luo, L. (2010). Genetic mosaic dissection of Lis1 and Ndel1 in neuronal migration. Neuron, 68(4), 695-709. Li, C., Zheng, Z., Ha, P., Chen, X., Jiang, W., Sun, S., ... & Chen, E. C. (2018). Neurexin Superfamily Cell Membrane Receptor Contactin‐Associated Protein Like‐4 (Cntnap4) is Involved in Neural EGFL Like 1 (Nell‐1)‐responsive Osteogenesis. Journal of Bone and Mineral Research https://doi.org/10.1002/jbmr.3524. Geraets, R. D., Langin, L. M., Cain, J. T., Parker, C. M., Beraldi, R., Kovacs, A. D., ... & Pearce, D. A. (2017). A tailored mouse model of CLN2 disease: A nonsense mutant for testing personalized therapies. PloS one, 12(5), e0176526. Miller, J. N., Kovács, A. D., & Pearce, D. A. (2015). The novel Cln1R151Xmouse model of infantile neuronal ceroid lipofuscinosis (INCL) for testing nonsense suppression therapy. Human Molecular Genetics, 24(1), 185–196. http://doi.org/10.1093/hmg/ddu428.